What might happen to terrestrial and marine ecosystems in the Antarctic as climate change progresses is a question that has interested researchers working on the planet's southernmost continent for some time. Figuring this out is the primary goal of the Latitudinal Gradient Project (LGP), an international, multi-disciplinary project that involves researchers from New Zealand, Italy, and the United States. The aim of the project is to look at how ecosystems vary along a north-south latitudinal gradient in the Antarctic and use the difference in latitude - and thus differences in key environmental variables such as incoming solar radiation - as a proxy for climate change. In the case of the LGP, the latitudinal gradient being used as a proxy is the Victoria Land coast along the Ross Sea, where New Zealand, Italy and the United States have research stations (Scott Base, Mario Zucchelli Station, and McMurdo Station respectively). A total of 18 terrestrial, marine or freshwater research projects are being conducted at different times up and down the coast under the LGP over a 15-year period between 2000 and 2015, primarily during the austral summer. So far, over half of the sites originally envisioned to be studied under the LGP have been visited. Research in several different scientific disciplines has been going on along the Victoria Land coast for over half a century. The LGP provides a framework and broader perspective for pre-existing research and new studies being conducted in Victoria Land. In addition, the LGP encourages collaboration between different disciplines, particularly by concentrating research at specific sites, thus enabling direct comparisons between sites and allowing for a "complete ecosystem" picture to be built. "The questions that the LGP are trying to answer were essentially already there," said Ms. Shulamit Gordon, Project Manager of the New Zealand LGP. "But also following up on a lot of previous work that had already been done along the Victoria Land coastline, the Antarctic scientific community believed that the LGP would be the next logical step - formulating some specific questions to address through research within the context of climate change." In the late 1990s researchers from various disciplines working in the region began to seriously discuss the possibility of using the latitudinal gradient along the Victoria Land coast as a proxy for climate change, as its entire length from Cape Hallett at 72°S to the southern tip of the Ross Ice Shelf at 86°S runs north to south within a relatively narrow stretch of longitude. Several workshops were held on the issue, beginning with a workshop at the 1998 SCAR biology meeting in Amsterdam, and over the course of a few years the LGP framework was developed. The LGP's general hypothesis is that ice-driven dynamics control the structure and function of marine, terrestrial and freshwater ecosystems along the Victoria Land coast. Thus, the project entails doing research on ecosystems up and down the coast, building a comprehensive picture of what goes on at each location, comparing different locations, and studying the differences in ecosystems as latitude increases or decreases. The comparison of data between the different locations is then used to gain insight into how terrestrial, marine and freshwater ecosystems all along the coast might be changing in response to climate change.In order to examine how climate change is affecting these various ecosystems along the Victoria Land coast, research in a wide variety of disciplines such as terrestrial and marine ecology, geology, and geochemistry is taking place at five pre-selected locations: Cape Hallett (72°S), Terra Nova Bay (75°S), Granite Harbour (76°S), Darwin Glacier (79°S), and Beardmore Glacier (83°S), with plans for an additional site at New Harbour (77°S). At each location there is, or will be, an automatic weather station (AWS) that collects data on air temperature, wind velocity, solar radiation and other parameters - data that any scientist working along the coast can use in his or her research. Of course for a project such as the LGP, the more data the better. Having five pre-selected locations does not exclude including data that might be gathered at places in between these pre-selected locations or from other places in Antarctica that have a coast that follows a nice latitudinal gradient such as the Antarctic Peninsula. And while research for the LGP officially started in 2000 and is supposed to continue until 2015, any historical data collected from the region before this period will also be included in the final analysis. How does ecosystem structure and function change with latitude, and why? What is the role of persistent, large-scale ice structures in defining community composition? How do snow and ice dynamics influence ecosystems and ecosystem processes? How does climate affect the availability and composition of free water? How does climate affect the predictability, persistence and extent of sea ice cover? How are key marine biological processes influenced by sea ice conditions? How does soil development influence terrestrial ecosystems? To what extent are past conditions preserved in paleoindicators? As the LGP is a framework for research and does not direct each country as to how research activities should be undertaken, each nation's approach and contributions to the LGP are different. For example, New Zealand currently has nine LGP-related research projects taking place in Victoria Land, the largest number of any country involved in the project. As the only country involved to have set aside money and manpower to be used specifically for the LGP, New Zealand has appointed a Project Manager, Ms. Shulamit Gordon, to coordinate New Zealand's LGP-related research activities. As for the Italians and the Americans, neither has devoted funding specifically to the LGP, although their contributions to the project are still very significant. The Italians have four terrestrial programmes and a handful of marine programmes within the Terra Nova Bay region, and have cooperated with New Zealand on a number of projects. Although their programme has recently faced a slowdown, the Italians have collected a lot of data and continue to look at ecosystems within the LGP framework. 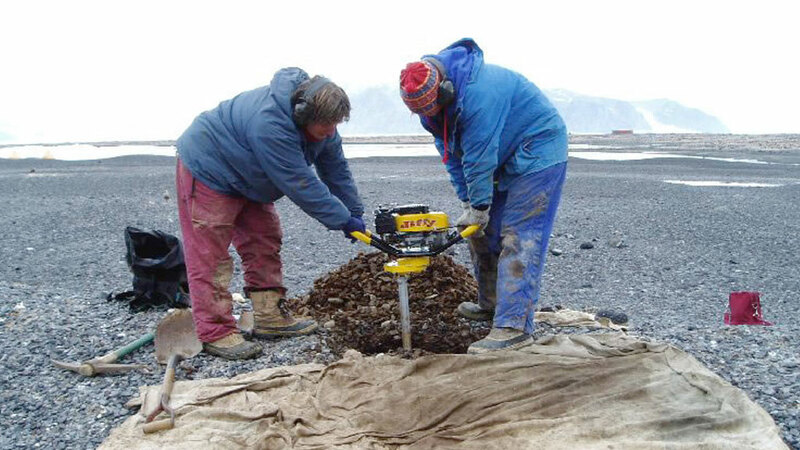 The United States' contribution to the LGP is mainly through research projects going on in the vicinity of McMurdo Station, which are already being carried out under the framework of the Long Term Ecological Research (LTER) Network. This is a broad research project that involves more than 1800 scientists and students investigating ecological processes over long periods of time in many different parts of the world, with two research sites in the Antarctic. A group from the LTER has also cooperated with New Zealand scientists at Cape Hallett, the northernmost LGP site. Despite each country's own unique way of participating in the LGP, the important aspect is that any and all kind of research is welcome. "Everybody has contributed to the project in whatever way they can, and the scientists have made connections through this project" said Ms. Gordon. "What unifies all the scientists working along the Victoria Land coast are the main hypothesis and the eight key questions that the LGP is trying to answer."